ANZAC Day, 25th April, is the day Australians and New Zealanders remember the original landing on Gallipoli in 1915, this was the first major military action fought by Australian and New Zealand forces during the First World War. ANZAC stands for Australian and New Zealand Army Corps, The soldiers in those forces quickly became known as ANZACs, and the pride they soon took in that name endures to this day. Why is ANZAC Day Special? In 1915 Australian and New Zealand soldiers formed part of the allied expedition that set out to capture the Gallipoli peninsula to open the way to the Black Sea for the allied navies. The plan was to capture Constantinople (now Istanbul), capital of the Ottoman Empire and an ally of Germany. They landed at Gallipoli on 25 April, meeting fierce resistance from the Turkish defenders. What had been planned as a bold stroke to knock Turkey out of the war quickly became a stalemate, and the campaign dragged on for eight months. At the end of 1915 the allied forces were evacuated after both sides had suffered heavy casualties and endured great hardships. Over 8,000 Australian soldiers were killed. News of the landing at Gallipoli made a profound impact on Australians at home and 25 April quickly became the day on which Australians remembered the sacrifice of those who had died in war. Though the Gallipoli campaign failed in its military objectives of capturing Constantinople and knocking Turkey out of the war, the Australian and New Zealand troops’ actions during the campaign bequeathed an intangible but powerful legacy. The creation of what became known as an “Anzac legend” became an important part of the national identity of both nations. This shaped the ways they viewed both their past and their future. Australians recognise 25 April as an occasion of national commemoration. Commemorative services are held at dawn, the time of the original landing, across the nation. Later in the day ex-servicemen and women meet and join in marches through the major cities and many smaller centres. Commemorative ceremonies are held at war memorials around the country. It is a day when Australians reflect on the many different meanings of war. The Dawn Service observed on ANZAC Day has its origins in an operational routine which is still observed by the Australian Army today. The half-light of dawn plays tricks with soldiers’ eyes and from the earliest times the half-hour or so before dawn, with all its grey, misty shadows, became one of the most favoured times for an attack. Soldiers in defensive positions were therefore woken up in the dark, before dawn, so that by the time the first dull grey light crept across the battlefield they were awake, alert and manning their weapons. This was, and still is, known as “Stand-to”. It was also repeated at sunset. After the First World War, returned soldiers sought the comradeship they felt in those quiet, peaceful moments before dawn. 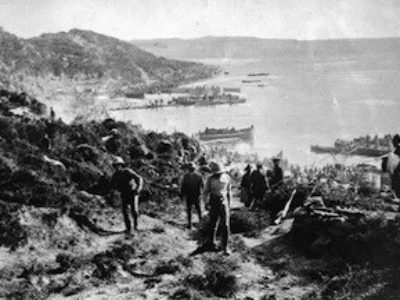 With symbolic links to the dawn landing at Gallipoli, a dawn stand-to or dawn ceremony became a common form of ANZAC Day remembrance during the 1920s; the first official dawn service was held at the Sydney Cenotaph in 1927. Dawn services were originally very simple and followed the operational ritual; in many cases they were restricted to veterans only. The daytime ceremony was for families and other well-wishers, the dawn service was for old soldiers to remember and reflect among the comrades with whom they shared a special bond. Before dawn the gathered veterans would be ordered to “stand to” and two minutes of silence would follow. At the end of this time a lone bugler would play the “Last Post” and then concluded the service with “Reveille”. In more recent times the families and young people have been encouraged to take part in dawn services, and services in Australian capital cities have seen some of the largest turnouts ever. Reflecting this change, the ceremonies have become more elaborate, incorporating hymns, readings, pipers and rifle volleys. Others, though, have retained the simple format of the dawn stand-to, familiar to so many soldiers. The Last Post, Rouse and Reveille are features of ANZAC Day Dawn Services. To learn more about thse Bugle calls and download copies, click here.